As planned, i took the final Monday of winter to explore a region of Arizona ripe with biodiversity. While part of the trip was made to observe the spring wildflower show in the area, i also wanted to get a feel for the over-all richness of the regions flora since the park where i was sits at the base of one of the most important eco region intersections in the southwestern U.S.
To describe both the human / cultural and natural history of both the bark and surrounding mountains would take way more space and time than even i could keep attentive long enough to read through. Needless to say both aspects of the region are rich and ..if the towering rocks above the trails could tell stories, would have many to tell.. From Native American tribes, and the people before them, to Spanish explorers, Ranchers and modern day folk, the area has much to tell regarding just how long people have inhabited the area. To describe the area's natural history, would likely take just as long ..if not longer. In a nutshell, the Catalina Mountains represent one of the most important portions of the overall Madrean Sky Island eco region. Here is where populations of Nearctic and Neotropical flora and fauna mingle. 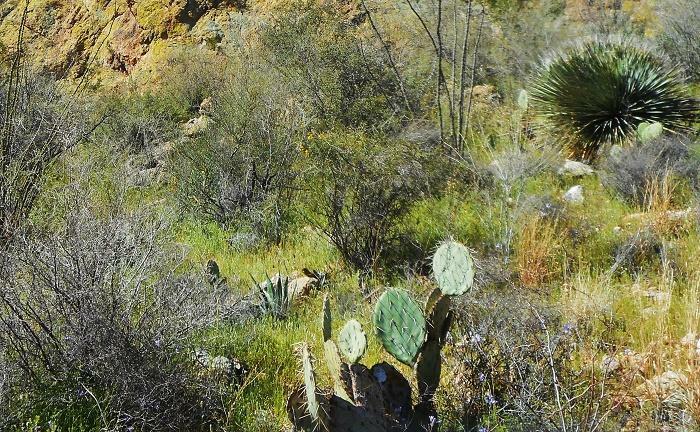 Many plants and animals whose ranges extend or might be expanding north out of Mexico find their first homes in the Sky island mountain ranges of southern Arizona. Many plants and animals who may have had larger ranges across lower elevations in Arizona and Northern Mexico in cooler climate times find a cool place to live higher up in the same mountain ranges. Here too is where you will find plants that are more commonly seen in California, or north in the Rockies, or east in the High Plains and Chihuahuan Desert. The areas animal diversity is among the highest in the country.. from Bears, Desert Bighorn Sheep, and Mountian Lions to Coatimundi, Javelina, and Ringtail Cat.. you will encounter all in the wilderness here. The region is also part of the efforts to re introduce Mexican Gray Wolves, was home to Thick Billed Parrots and California Condor ..and possibly all 3 of the super rare Cats that show up in surrounding mountains closer to the border, including Jaguar and Ocelot. Bird, Insect, and Reptile diversity is just as great here and both the park and Catalina Mountains are a mecca for birdwatchers and researchers alike. A couple years back, a new species of Scorpion was found here and various projects scouting new and revisiting older spots in the mountains are finding new populations of.. or completely un described plants and animals. Just viewing the mountains from anywhere in Tucson, it isn't hard to imagine that the surrounding mountains to the east and south are very special places. While there were some missed opportunities ( you'll see ) and stuff that one will only find growing / flowering during the Summer Monsoon season, the trip was great.. with lots to see. Warm but not too hot ( yet ). Most of the washes in the Park were running and you could see snow higher up as you approached the park. While i didn't really stray far from established trails, i didn't have to go far outside official park boundary to encounter a pretty amazing diversity of cool stuff. Catalina State Park is bounded by both the Pusch Ridge Wilderness, and much larger Coronado National Forest. If one has a few days, several trails from the park lead to the top of Mt. Lemmon at 9159 ft, and to other more remote parts of the Catalina Mountains. One could probably reach Mica Mountain in the nearby Rincon Mountains from here also. With all the great diversity here, kind of a bummer the ranges of any near by palm species didn't extend into the canyons here.. as far as what is known.. Pretty sure this is Cylindropuntia versicolor. Nice big boy in picture #3.. taller than the surrounding Mesquite ..which aren't all that tall to begin with. Thinking Cylindropuntia leptocaulis, but both C. arbuscula and C. kleiniae occur in the Park as well. Not quite sure on the species of the last two. One kind of looks like C. spinosior, which also grows here. Echinocereus fasciculatus ...or E. engelmannii v. fasciculatus as it's sometimes labeled. What could that be to the far left?? Next up.... A couple Unexpected finds, and missed opportunities.. It was once said that when out looking for plants, one must have a keen eye and thoroughly examine every detail in the landscape since something you might really be looking to observe can blend into surrounding vegetation.. and of course, after i get home and start going through pictures, i see something i missed, that was practically under my nose. Go figure lol. Ocotillo and a Barrel Cactus hanging out on a rock ledge across a canyon. Whats so special about sticks?? well, these sticks are dormant Jatropha cardiophylla, AKA one of our native Limberbush. Thinking this is the northern -most occurring species in this Tropical Genus. Neat to find them growing here. Ferns?? in the desert?.. Yep. Spiny Cliff Brake, Pellaea truncata. Used to seeing these, or a similar sp. in CA. Spike Moss, Selaginella sp. Possibly S. rupincola. Some flowers and interesting Shrubbery / trees next up.. After i find out what is digging into the back of my heels.. Some typical and not so typical flowers here..
Desert Anemone, Anemone tuberosa.. Who'd think you'd find Anemone in the Desert.. Lucky encounter since this was the last flower on this group of plants. ... Hopseed, Dodonaea viscosa. Yes, the same plant that can throw around clouds of seed capsules in the landscape, growing naturally here ..and looking rather tame. 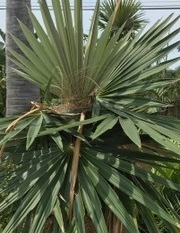 Same plant that is also native to Australia and Africa. Canyon Ragweed, Ambrosia ambrosioides, Not exactly a shrub but resembles ( and smells) like Yerba Santa ( Eriodictyon) at first glance. Used by Native Americans to treat Coughs. Mexican Blue Oak, Quercus oblangifolia.. Had hoped to encounter these here. Similar to CA. Blue Oak but supposedly tolerates more Drought. While these specimens are somewhat greener, Foliage can be quite Blue in some specimens..
Net Leaf Hackberry.. Perhaps not exactly the most interesting tree i could have encountered here but looking at that bark, i can think of all sorts of stuff i'd try and grow on it in the garden..
....And lastly, some views and vistas..
..Yea, i know this is the "Tropical Plant" section of the forum but i can't end this thread without sharing some views into a region where two worlds come together and offer the viewer a glimpse into both the past, when the region was cooler, and the present ( ..and perhaps the future ) where plants and animals of a more Tropical origin hang out, or may be movin' on in. While i missed getting shots of the native Agave here, and didn't find any specimens of our native Coral Tree, Erythrina flabelliformis, ( they're bare this time of year anyway ) Certainly a worth while trip, beat up heels and all. 9AM view of the Sutherland Wash as i start the day. Views along the trail. Interesting that the Mesquite here are quite short, giving the appearance of an abandoned Orchard instead of a really dry Mesq. Bosque. Montrose Pools ( Normally dry ) and view up into Romero Canyon.. To get to Romero Pools requires climbing another 1500 ft. Fro there, you can connect with the trail that heads to the top of Mt. lemmon. Some Poppies and Chia flowering near the Wash on the way back. Views from crossing the wash (again) After a warm day, the cool water attracts lots of attention. Was not expecting the park to be as busy as it was on a Monday..
A parting zoom up into the Catalinas. Notice the snow still hanging around some of the peaks. Pine atop others. Secondly, this same species of Flycatcher is apparently expanding it's range. According to E-Bird data, the species can now be seen regularly across most of Southern CA. and possibly in the Bay Area ( South end of San Jose ) and southern Central Valley. It also apparently is turning up more often across areas of Texas, and as far east as Florida where it hadn't been seen in the past lately.. Pretty cool. What a fantastic array of photos! Reminds me so much of the hikes taken through similar terrain eons ago. The pics of the xeric ferns are too much, thanks Nathan!! I love the desert, so beautiful, hope to go there some day. Thanks for the photos. Awesome photography and commentary on the beauty that is the desert! Thank you! Beautiful, I need to get back out to Arizona soon. @NatureGirl Yes, when you get the chance, the Desert is a remarkable place to visit, especially when /if you have the opportunity to see how it transitions from the hot, somewhat barren "lower" Desert around Phoenix, to how it looks, at a slightly higher /cooler/ wetter elevation around Tucson ...to the Mesquite ( And Saguaro -less) Savanna south of there, towards the Border. Then of course, is the environment up in the mountains, especially during the summer Monsoon season when the landscape ( in wet years ) can turn almost as green as Florida at the same time.. Mountains nearer the Border are something else at that time of year. That's also when it is very possible to see up to 14 species of hummingbirds, several which cross into the state from Mexico. @Gonzer While i'd expected i might find the Cliff Brake growing there, finding Wavy Cloaks was totally unexpected. I'd thought i might have to gain another thousand feet in elevation before i might encounter them.. While i didn't find any, the humble Ball Moss ( Tillandsia recurvata ) reaches into Southern AZ just south of the Catalinas.. While not documented, i wouldn't be surprised if it is growing somewhere nearby.. Anyway, i figured you, among some other members might appreciate finding the Ferns as much as i did.. Seeing the ferns, Desert Anemone, and Jatropha cardiophylla were probably the highlights of the trip. @bubba As always, you're welcome.. You too should plan a trip to do some exploring here sometime in the future..
@Meangreen94z I know what you're saying.. Part of the reason for the trips has been some of the pictures Gee ( over on Agaveville ) has posted from all the trips he and others like Greg have made into various parts of the state to document Agave, etc.. I myself want to explore more of Texas, than what i have seen in passing, or on quick trips later on. Excellent photos Nathan! Thank you for the wonderful commentary too. Pretty amazing how many tropical birds find their way into Arizona. The Grand Canyon is full of really unique, tropical birds that follow the Colorado River northward. Totally awesome-tuous images! Especially liked the ocotillo and the Castilleja.